Forget Samsung's bevy of super-slim and much-marketed LED TVs - it's actually the brand's plasmas that see it at the peak of its powers. Strapped with its fast evolving and increasingly ambitious Smart Hub online platform, the 51-inch Samsung PS51D8000 includes apps for movie and media streaming, as well as web browsing, home networking and digital media playback. The Samsung PS51D8000 increases its reach in more ways than that. Unusually dimensioned because of a slightly slimmer bezel (at 23mm it's still not as slim as an LED TV, but it's a fine effort nonetheless) that creates a slightly larger playground for the plasma cells, this TV is an excellent example of why the gloss black template - initially popularised by Samsung - should be binned. Nicknamed the 'Metal Crystal' design by Samsung, the unusual look of this TV involves a slither of transparent plastic around the outside of the bezel, while a spider stand adds to the allure. The insides of the Samsung PS51D8000 are a similarly polished affair, with tuners for Freeview HD and Freesat HD - complete with USB pause and record features - and, of course, a 3D option. 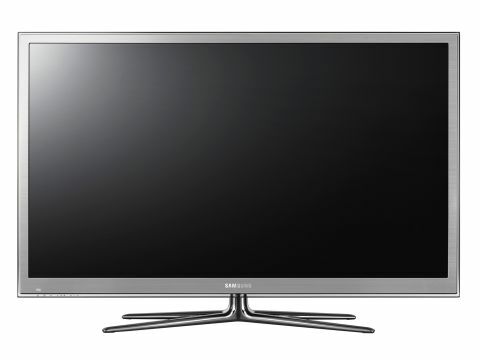 The most obvious alternative to this plasma TV - priced at £1,350 in the UK and $2,300 in the US - is Samsung's 51-inch PS51D6900. This is a lower spec and much cheaper plasma screen that's mopped up the mass market. Samsung also offers a smattering of lower-spec 3D plasmas, including the 43-inch PS43D490, 51-inch PS51D550 and 59-inch PS59D550 (the latter two have a Full HD resolution and a Freeview HD tuner). Away from Samsung, Panasonic's stable of 3D televisions - such as the Panasonic TX-P50GT30B or similarly 3D glasses-free Panasonic TX-P50ST30B - will most suit those after an active shutter 3D plasma. It's also just about worth considering active shutter LED TVs such as the Sony KDL-46HX923 or Samsung UE46D7000, and passive 3D LED TVs such as the LG 47LW550T.